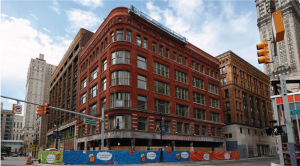 Restoring the long vacant and crumbling 1897 building built by one of Detroit’s pioneer families to its former glory in downtown’s Capitol Park neighborhood required a new hydronic heating system. R.L. Deppmann provided Bell & Gossett Series e-80 and Series e-60 inline pumps, known for their hydraulic and energy efficiency, as part of the total HVAC system. For large arenas and stadiums, the true test of the plumbing system is when the facility is full of spectators. To simulate game-day use prior to opening, facilities hold a Super Flush test to ensure it’s all systems go. During the Super Flush at Little Caesars Arena involving 235 toilets and 120 urinals, the Bell & Gossett Technoforce four-pump variable speed pressure-boosting system adjusted speed and flow to meet demand without a hitch. Read more about RLD’s work with installing contractor Ben Washington and Sons and engineer Smith Group Inc. at Little Caesars Arena. In order to meet ASME/ANSI code for elevators with fire protections systems that require a means of removing water from the pit below the elevator, R.L. Deppmann provided Bell & Gossett 2WF submersible sewage pumps for the six apartment buildings in the City Modern development. Code calls for a drain or sump pump that is capable of removing the water at a flow rate of 50 GPM — the B&G 2WF delivers capacities up to 185 GPM. Engineer: Strategic Energy Solutions Inc.; installing contractor: Ben Washington and Sons. The renovation of the long-vacant 14-story Metropolitan Building into Detroit’s first Element Hotel included a new plumbing system that could deliver reliable water pressure for services and guests of the Westin’s ecofriendly boutique hotel. A Bell & Gossett Technoforce triplex variable speed packaged booster system ensures the smart use of water throughout the hotel, from the Studio Commons lounge to The Monarch Club with rooftop views of the city. Converting the 1929 Michigan Bell office building to the Neighborhood Service Organization (NSO) headquarters and housing for homeless adults required changes to the plumbing system. The renovation created 155 one-bedroom apartments to provide permanent residences for the formerly homeless and access to support services. Providing water to each apartment is achieved with two highly efficient Bell & Gossett Technoforce pressure booster systems. With about 35 million travelers in and out of Detroit Metropolitan Airport (DTW) each year, it’s one of the busiest airports in the country. On the heels of two decades of improvements, a new 20-year master plan began in 2016 to ensure facilities continue to meet demands. RLD’s work on hydronic HVAC systems with EAM Engineers and Long Mechanical integrates high-efficiency Bell & Gossett products in the context of total system design that further maximizes efficiencies. The presses at the record pressing plant require hot steam to soften the vinyl, and within a few seconds of pressing, the vinyl must be cooled with chilled water. R.L. Deppmann used its practical design and equipment experience to recommend a variable speed chilled water system coupled with a Bell and Gossett GPX free cooling heat exchanger. B&G e-Series high-efficiency pumps were specifically selected to avoid pressure spikes that would cause production issues. 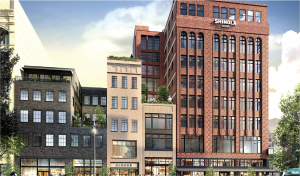 “Nostalgic yet thoroughly modern” describes the renaissance of the historic eight-story building into a boutique hotel on what was the busiest corner in America in the 1920s, a partnership between real estate firm Bedrock and lifestyle brand Shinola. The hydronic heating system is also getting a modern upgrade with Bell & Gossett’s ecocirc XL 65-130 circulator pumps that feature remote monitoring and electronically commutated permanent magnet motor technology to achieve the highest efficiencies. 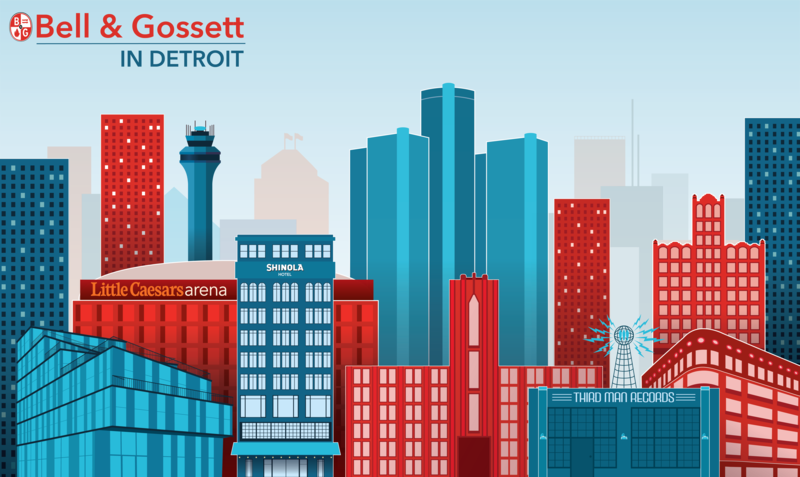 How Bell & Gossett Solves Buildings in Detroit with R.L. Deppmann Co.
With more than $5 billion in construction projects in the works in the city of Detroit, signs of resurgence abound in Motor City. From Corktown and Greektown to Midtown and Downtown, Detroit’s recovery is for real. Bell & Gossett manufacturer’s representative R.L. 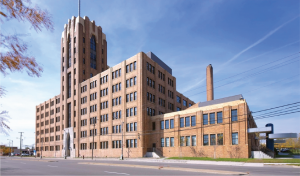 Deppmann Co. shares its deep component and system knowledge with engineers, contractors and facility managers to find the right system design solutions for hydronic HVAC and plumbing systems in a multitude of projects that are energizing Detroit. Learn more about the full-service team at RLD. From the painstaking restoration of the intricate tera cotta and red-tiled exterior of the building to the thoughtfully curated hospitality experience, attention to detail is theme of this renovation project. The same goes for Bell & Gossett’s gasketed plate and frame heat exchangers, part of the Shinola’s hydronic heating system. The innovative chevron plate design provides more heat transfer using less space — one-third to one-fifth the surface area of conventional shell and tube heat exchangers. R.L. 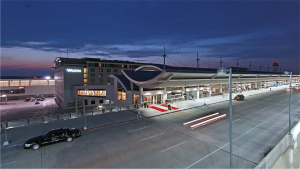 Deppmann partnered with Western Mechanical and Integrated Design Solutions on the project. Working with Guardian Plumbing and Detroit Boiler on a tight deadline, R.L. Deppmann’s recommendation of a free cooling system means the chiller can be offline 70 percent of the time, saving energy. Read more about the R.L. 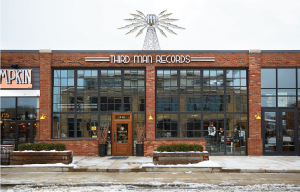 Deppmann team’s work at Third Man Records. New mechanical systems at DTW feature Bell & Gossett e-1510 pumps, which provide the highest overall efficiency in the end-suction market for HVAC and plumbing applications. With the largest Efficiency Island — the sweet spot on the pump curve — compared to other similar pumps, the e-1510 reduces electricity consumption, improves overall system performance and lowers life cycle costs. The TechnoForce pressure booster system is designed to ensure the required pressure and flow is maintained to meet demand within the building. The system continuously monitors parameters such as speed, amperage, voltage and pressure to provide total system protection. Installing contractor: Jermor Plumbing & Heating; consulting engineer: Potapa Van Hoosear Engineering. Once destined for demolition, the Element Detroit Downtown at the Metropolitan Building is a $32 million redevelopment project with a focus on sustainability. Working with MEP firm Peter Basso Associates Inc. and Jermor Plumbing & Heating, the R.L. Deppmann team recommended the Technoforce variable speed pressure boosting package to ensure reliable system flow and pressure and minimize energy costs. Located on 8.4 acres in the historic Brush Park neighborhood north of downtown, the $100 million City Modern development under construction is the largest residential development in Detroit in 30 years. Four Victorian mansions and 20 new buildings on formerly vacant parcels blend the modern with the historic. The project received The Congress for the New Urbanism grand prize award in 2016. During the design phase of the eight-story, $863 million home of the Detroit Red Wings and Detroit Pistons that opened in 2017, the R.L. Deppmann team provided technical engineering support for the design of a plumbing system that could respond to intermittent use — periods where demand would be very low or extremely high. RLD provided a Bell & Gossett Technoforce four-pump variable speed pressure booster pumping system to solve the challenge. The grand six-story building, also known as the Capitol Square Building, has reopened as a mixed-use commercial building with Detroit Institute of Music Education (DIME) as the primary tenant. R.L. Deppmann worked with MEP firm Peter Basso Associates Inc. and installing contractor Complete Mechanical Contracting Inc., on the project.